Acting is a tough business, and you need to be in good shape mentally and physically. As an actress we don’t beat one another. It’s whoever’s right for the part. Being a famous actress may give you a sense of being important, but believe me, it’s just an illusion. Before I thought there was a common denominator between my films – as if all my characters were sisters – but I’m not so sure now. But, you know, when I choose a film I need to believe in it and believe I can do something special with it, and after a while that means not trying to judge or analyze why I should do it. You have to follow this intuition thing, which is a mystery to me. But I think it’s a little different in Europe, because 40 is really the best age for a woman. That’s when we hit our peak and become this ripe fruit. But I’ve never felt that being an actress is being in a comfortable place. It’s seen from the outside that we’re being driven in big cars and having these gorgeous suites and all of that. But come on, it’s not about that. Choosing to be in the theatre was a way to put my roots down somewhere with other people. It was a way to choose a new family. Each new film is like a trial. Before I step in front of the camera, I do not know whether I am going to fall or whether I am going to fly – and that is exactly the way I want it to stay. I like travelling and if I have to come to Hollywood to make a movie I will, but otherwise I’d never move there. It’s very much an industry town and that doesn’t really interest me. I live for the present always. I accept this risk. I don’t deny the past, but it’s a page to turn. I never felt being an actor or making a movie was an easy thing to do. I sometimes feel like I could do another job. Anything. Maybe because as an actress you’re playing different characters, everything feels possible. I think acting is about forgetting yourself in order to give the best of yourself. It’s passing through you more than you’re creating it. You’re not the flower, but the vase which holds the flower. I think I am pretty much melancholic. I think it’s the same simple thing for everyone – to be happy, and have love in your life. I won’t do something just for the sake of working. 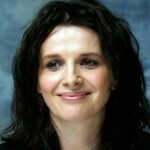 Juliette Binoche is an award-winning French actress, artist and dancer. She has appeared in more than 40 feature films, been recipient of numerous international accolades, is a published author and has appeared on stage across the world. Coming from an artistic background, she began taking acting lessons during adolescence.